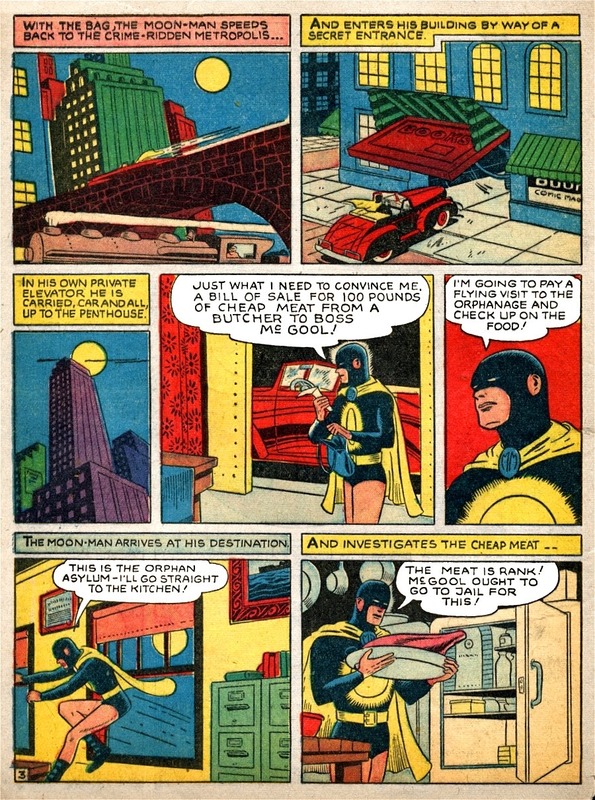 MOON-MAN, Golden Age One-Hit Wonder, in "The Poisoned Children"! 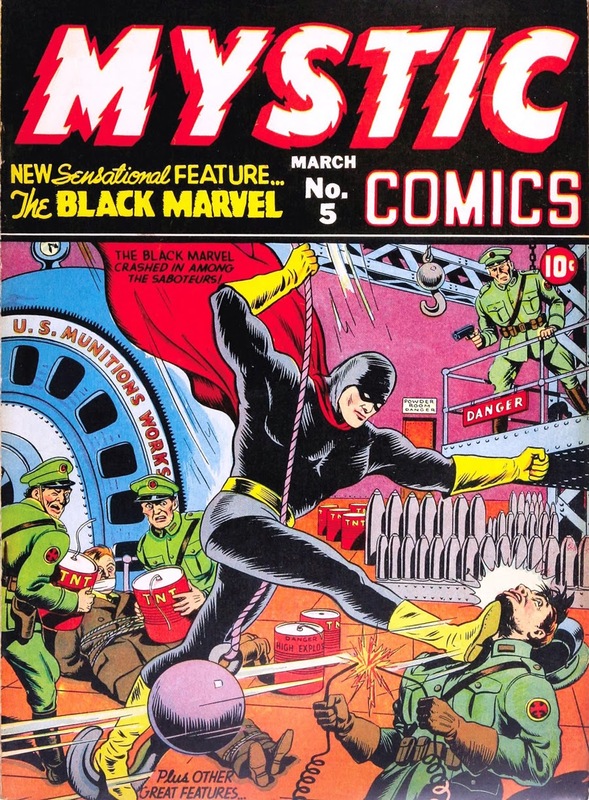 The MOON-MAN made his one and only Golden Age appearance in pre-Marvel Timely Comics' MYSTIC COMICS #5, in early 1941. 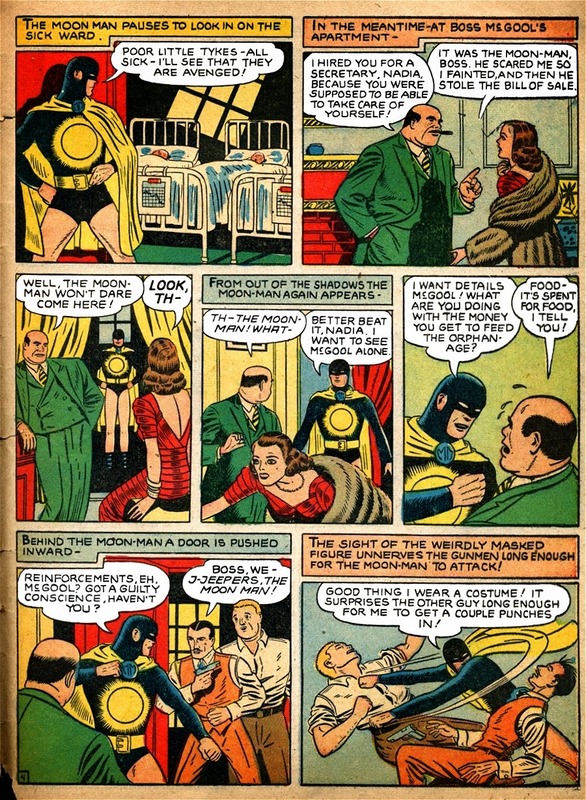 Sporting a glowing full moon emblem on his chest, the Moon-Man's powers (if any) seem a little vague, aside from breaking and entering (mostly through windows) and tussling with hoodlums. 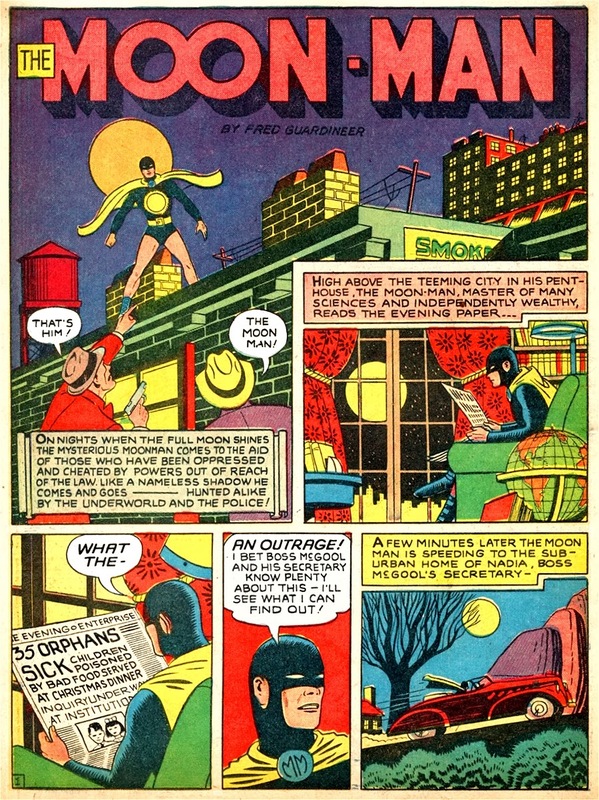 If nothing else, Moon-Man has an elevated sense of justice, and takes it upon himself to right the wrongs he perceives. 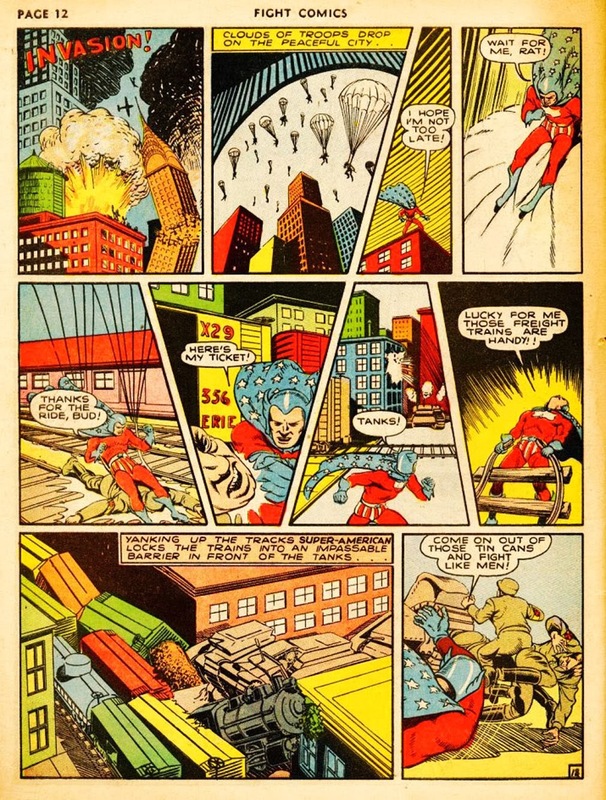 Moon-Man was drawn (and apparently created) by Golden Age great Fred Guardineer, who entered the field of comics in 1937, and two years later contributed to the now famous ACTION COMICS #1 (Superman's debut, of course) with his more well-known creation, ZATARA, the magician. 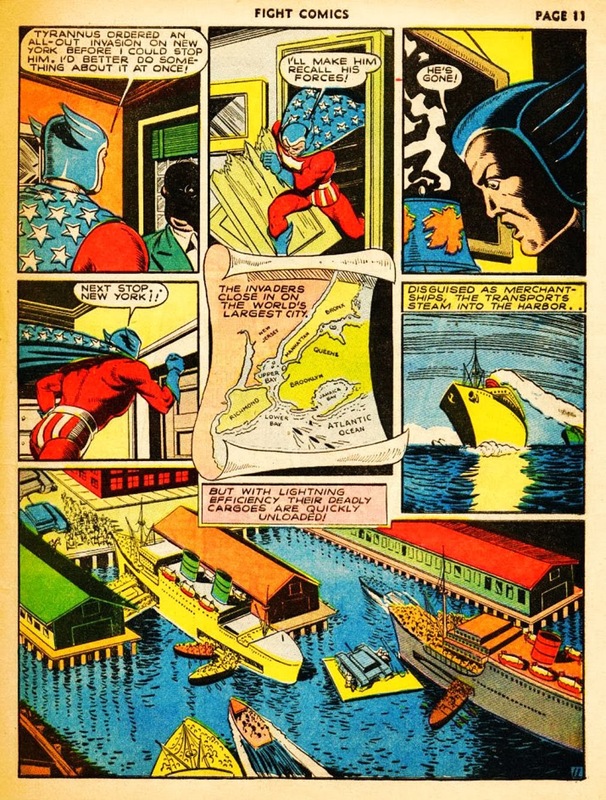 Guardineers's work appeared in comics published by Quality, Magazine Enterprises, and DC/National until 1955, when he retired from comics. 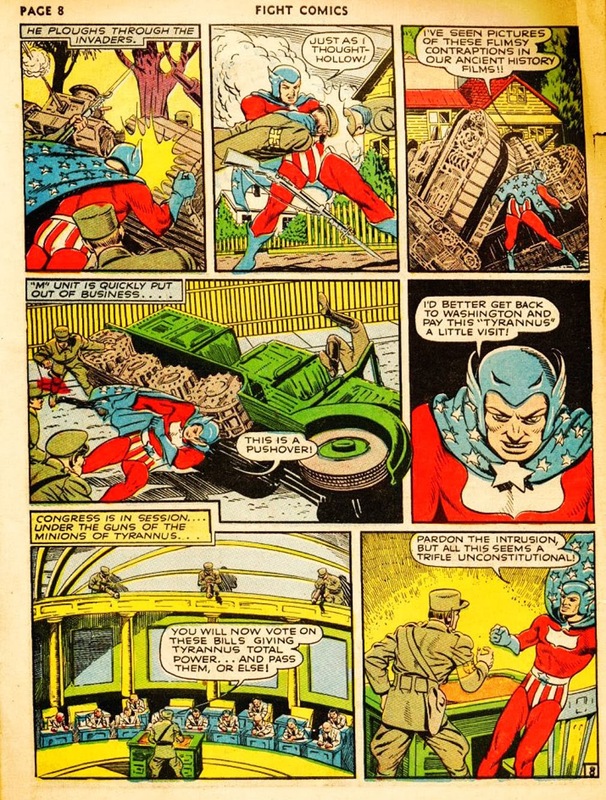 This story of the Moon-Man was his only effort for Marvel. 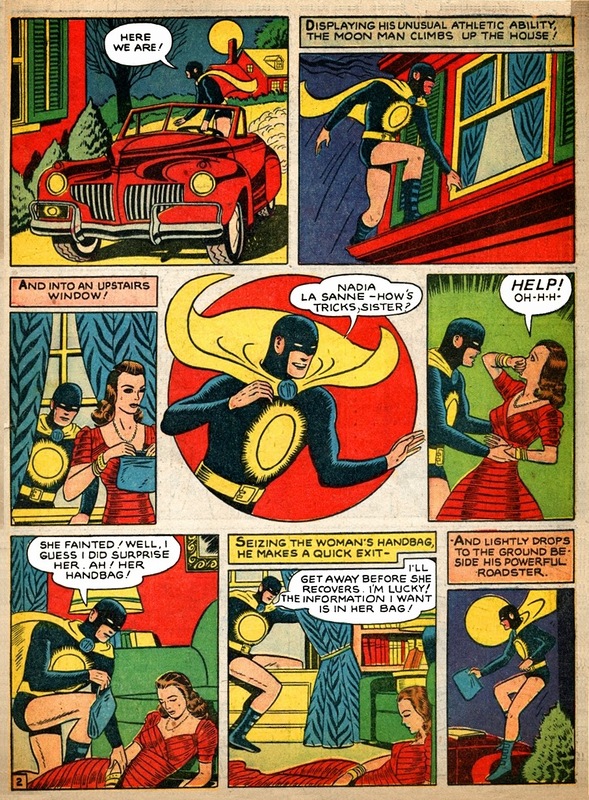 We can't be certain why Moon-Man never became a regular feature, as it was written and drawn as well or better than most comic stories of the era, and it holds a certain amount of charm even now. See if you find it as odd and humorous as I do! 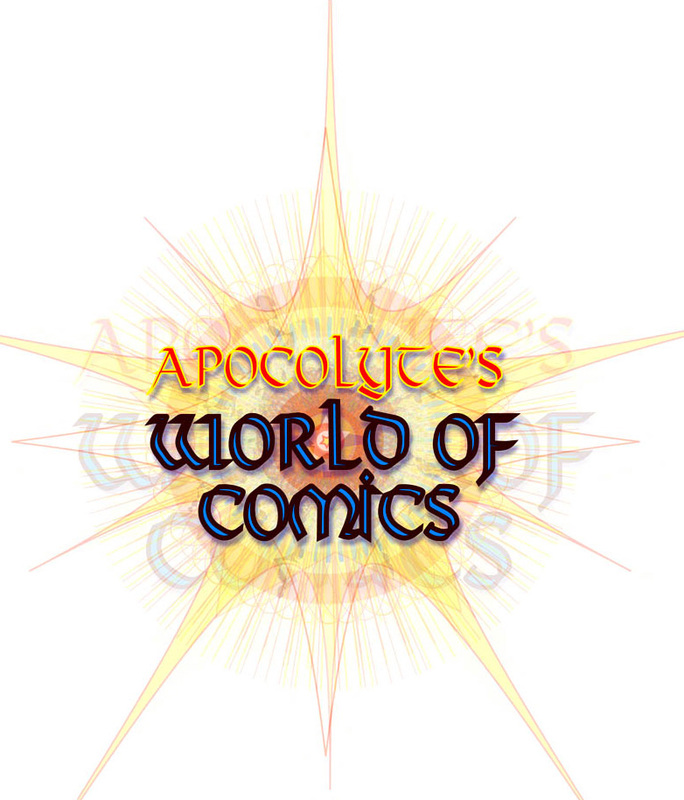 I can't help but comment on a few areas of this story that stand out in my opinion. 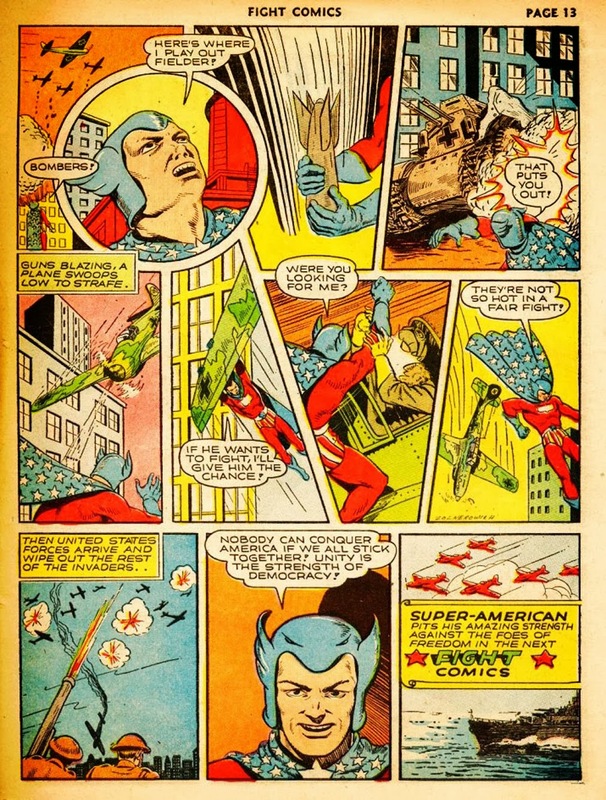 Sooooo...Moon-Man apparently has no secret identity, huh? 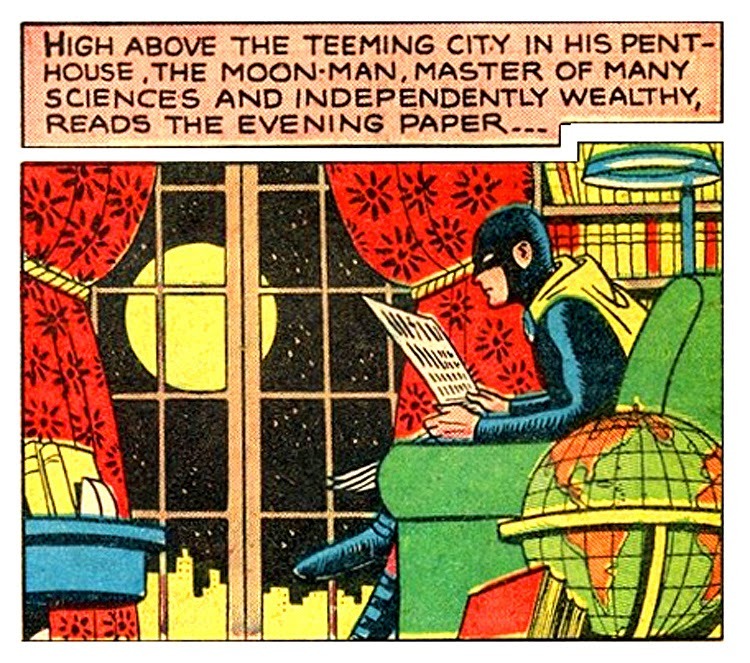 This independently wealthy master of many sciences hangs around his luxury penthouse garbed in full superhero regalia, mask, cape and all! 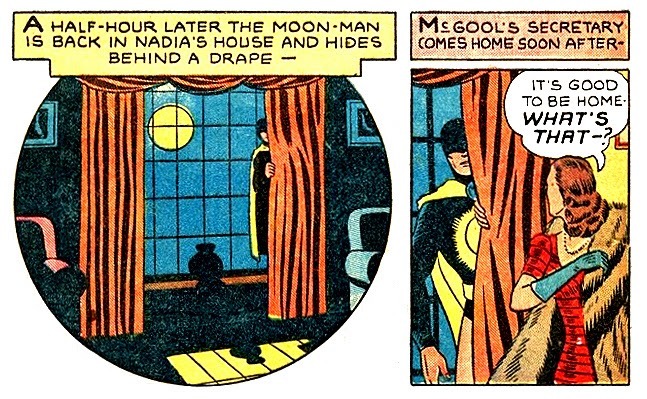 Careful, Moon-Man, sitting on your cape wrong could wrinkle it! I bet it gets in the way during those daily bathroom breaks, too! 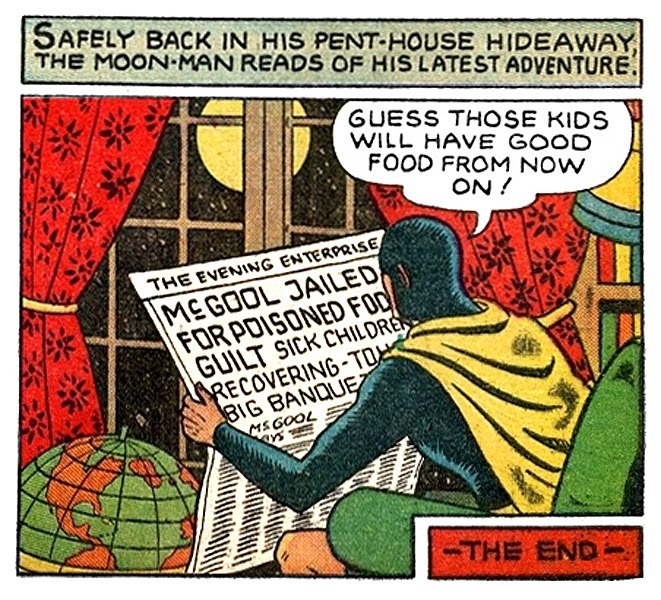 Sooo...okay, Moon-Man finds an outrageous crime to avenge, the food-poisoning of orphans! 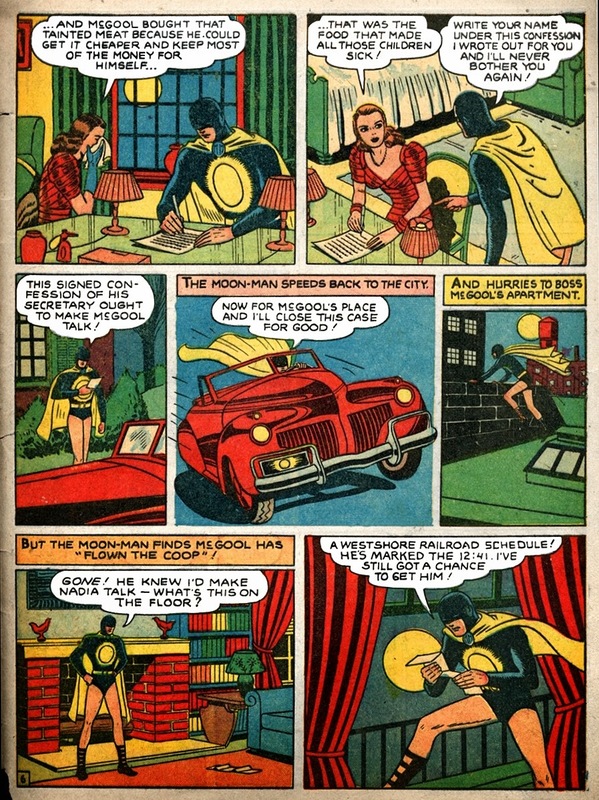 He leaps into action - good thing he was already dressed for crime-fighting. Bursting into the window of Nadia, he shocks her into fainting. 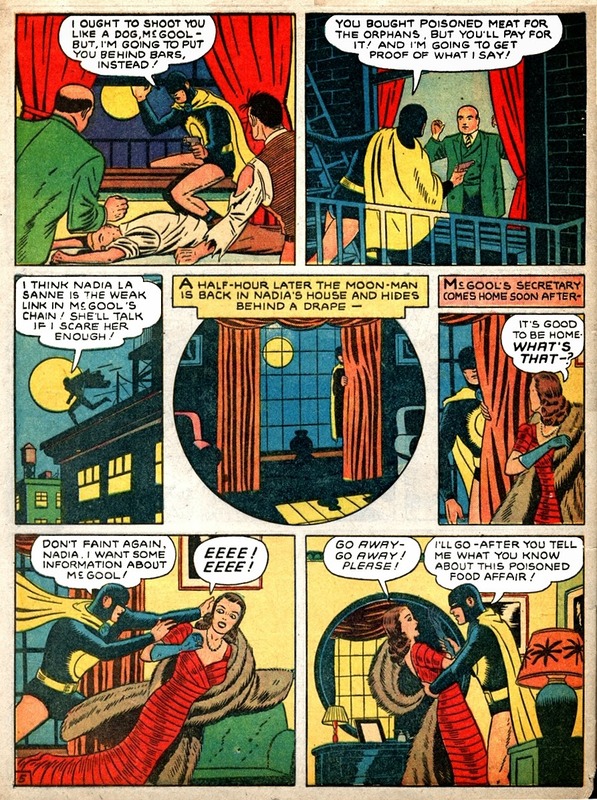 Being a red-blooded male, when confronted by a shapely, attractive female lying unconscious before him, Moon-Man does what comes naturally...he grabs her purse! 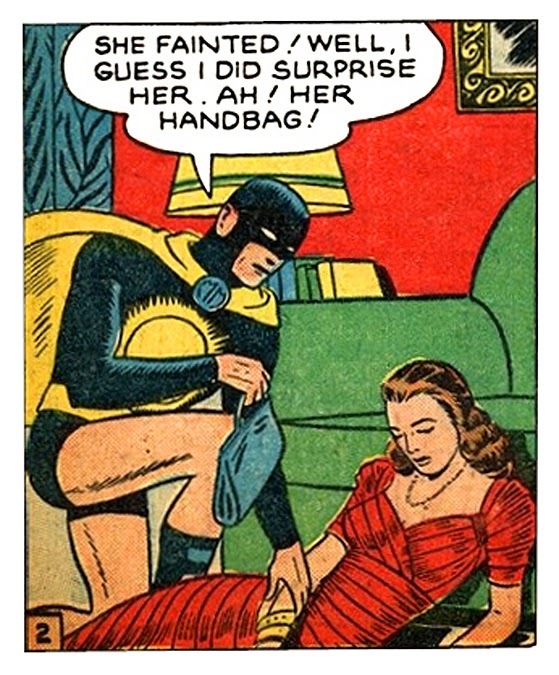 In his defense, it DOES go with his outfit more than hers! 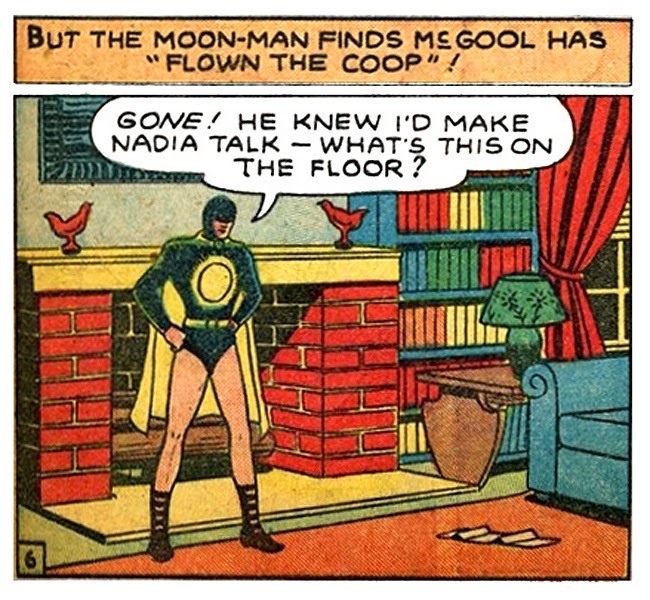 Having snatched Nadia's purse, Moon-Man races back to his hide-out. 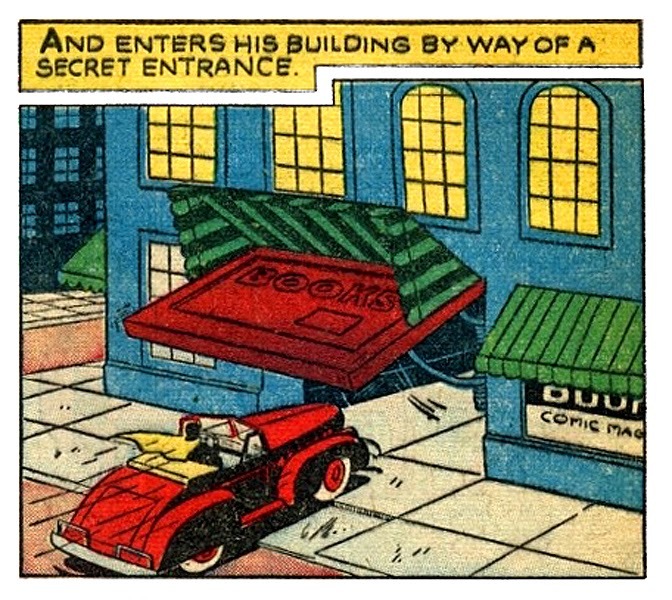 In this panel, we gain a clue to his background...to be precise: The way Moon-Man became independently wealthy? 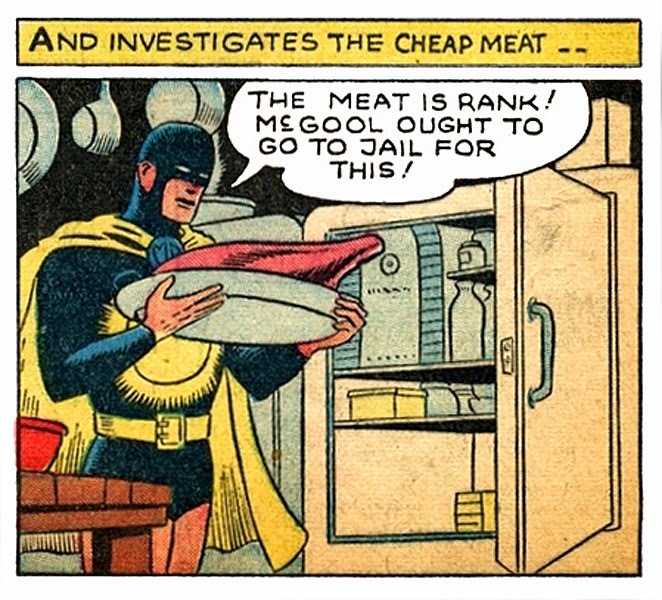 Moon-Man can't just take the word of the news report about tainted meat...noooo, he has to go smell it for himself! Pheew! Yep, that's some stanky meat, boy! 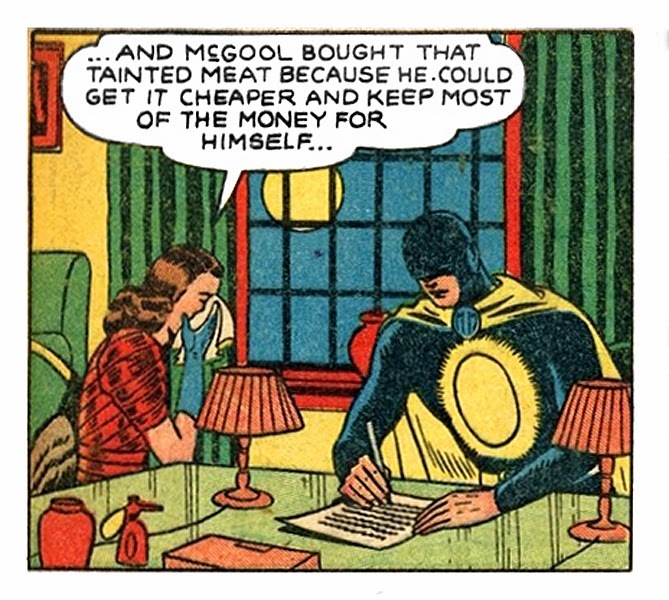 Now we get to the heart of the crime of the century...This criminal mastermind McGool took the slowest way to become rich ever devised, by purchasing cheaper meat for the orphans, and pocketing the savings! 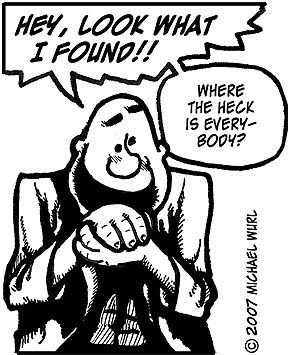 Now, that's not even a crime, that's just wise investing and smart business, aside from the resulting botulism. 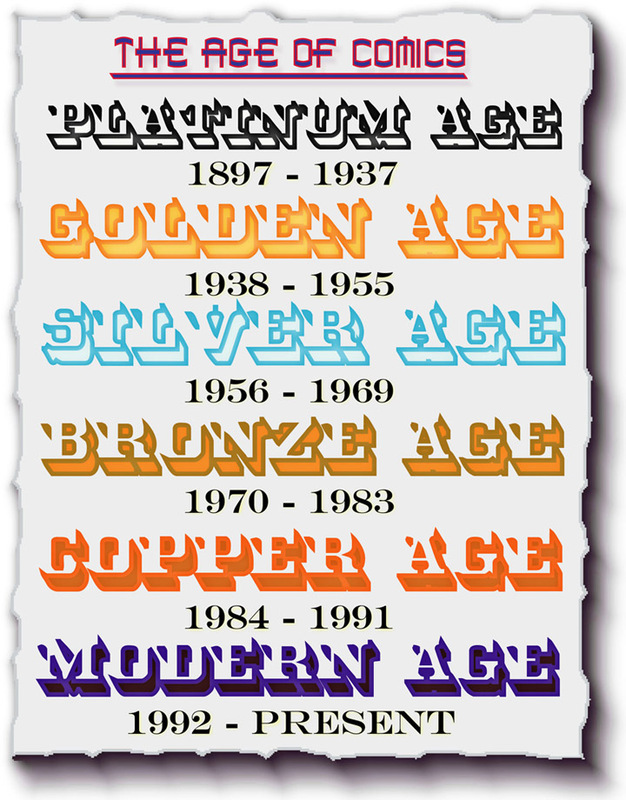 Now, keep in mind that prices for things in 1941 were considerably less than today, for example: bread was 8 cents a loaf, milk was 34 cents a gallon, gasoline was 19 cents a gallon, and a new house was about $6,900. So, for McGool to buy 100 pounds of cheap meat and pocket the profit would have made this evil genius about $27.83! That's pure profit, kids! Getting rich the hard way! Did you catch this one? 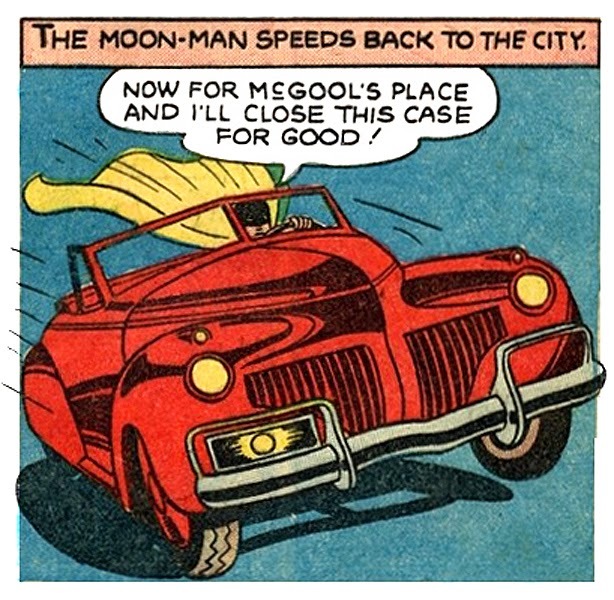 This is one of two comic panels that shows Moon-Man's licence plate...Yep, that's the same glowing moon logo that's on his chest! Is that even legal? 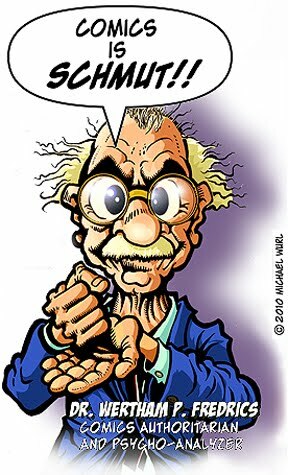 Try asking the DMV for that nowadays! 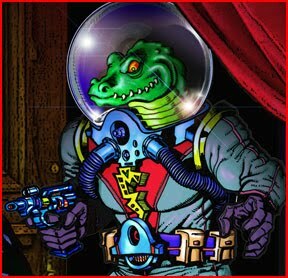 Wait a minute...I'm not a lawyer, but it's clear that for all the "many sciences" Moon-Man is "master of", the law isn't one of them. Phew, indeed! 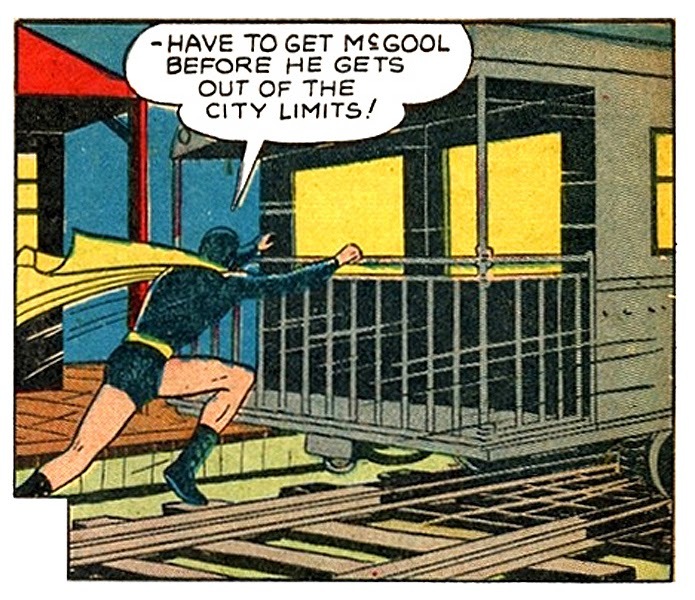 Moon-Man manages to leap of off the speeding train onto the jagged boulders hundreds of feet below while carrying the unconcious McGool. 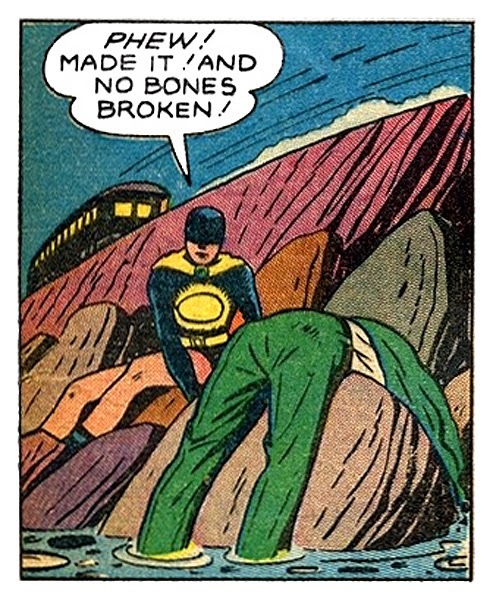 Moon-Man lands without a scratch, "No bones broken", but sadly, McGool's lifeless form, suffering massive internal bleeding and virtually every bone pulverized into dust, rests awkwardly upon the rocks. McGool's corpse is charged with accidental food poisoning. 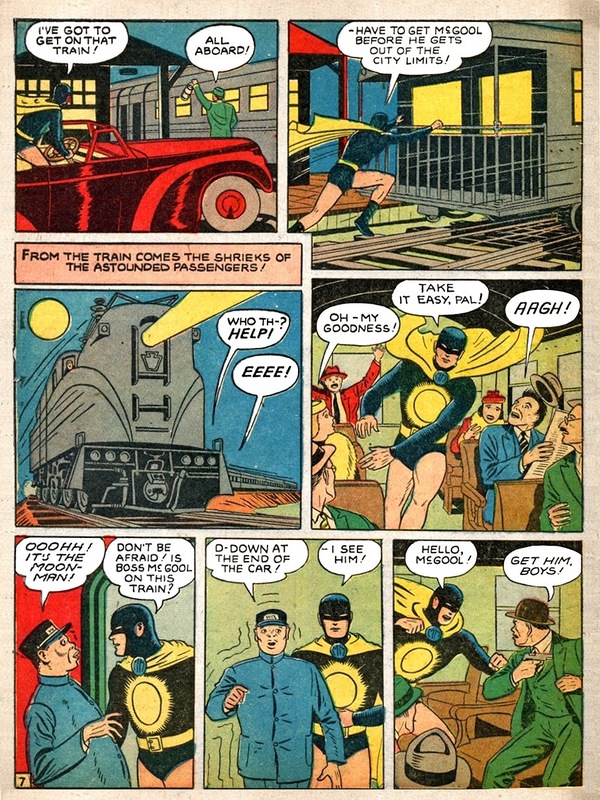 Moon-Man, on the other hand, is charged with speeding, breaking and entering, assault, purse-snatching, indecent exposure (those legs - yeesh! ), riding a train without a ticket, coercing a confession, 1st degree murder, and overdue library books. Ah, the happy ending! 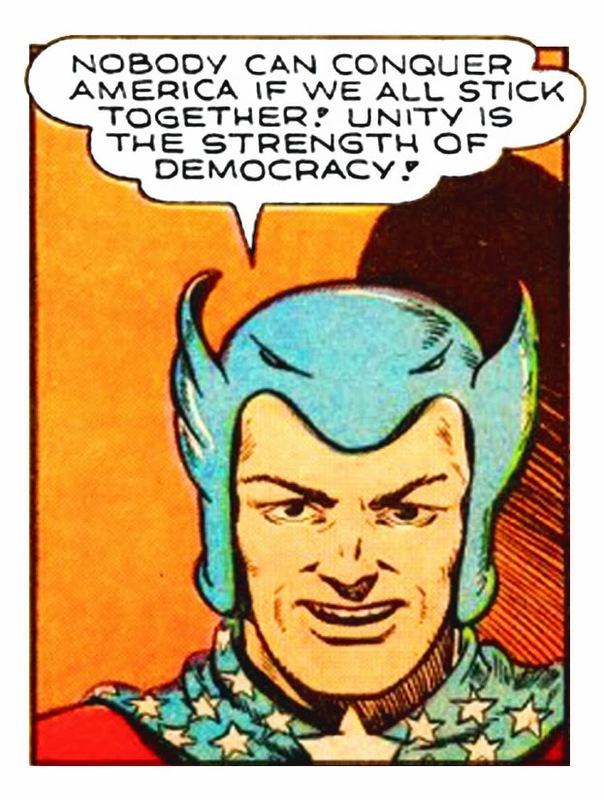 Now those orphans will eat good, right Moon-Man? 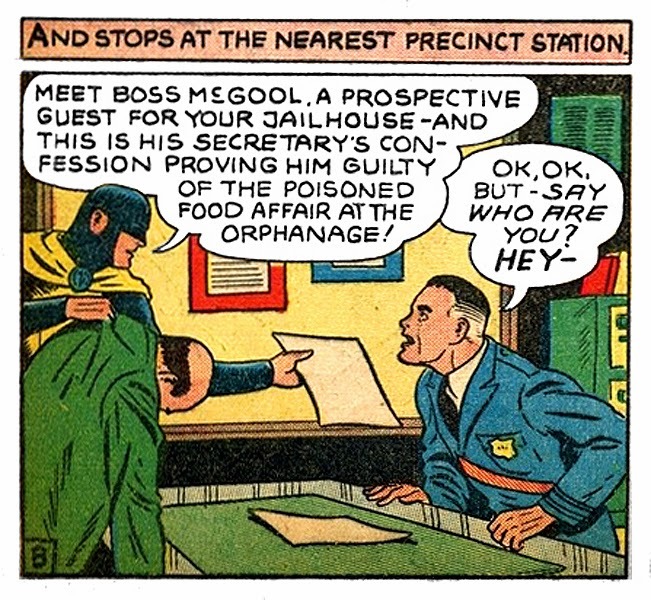 Nope, with McGool in jail, the orphanage goes bankrupt and closes, forcing all the orphans out onto the street, where they all starve to death. THE END! 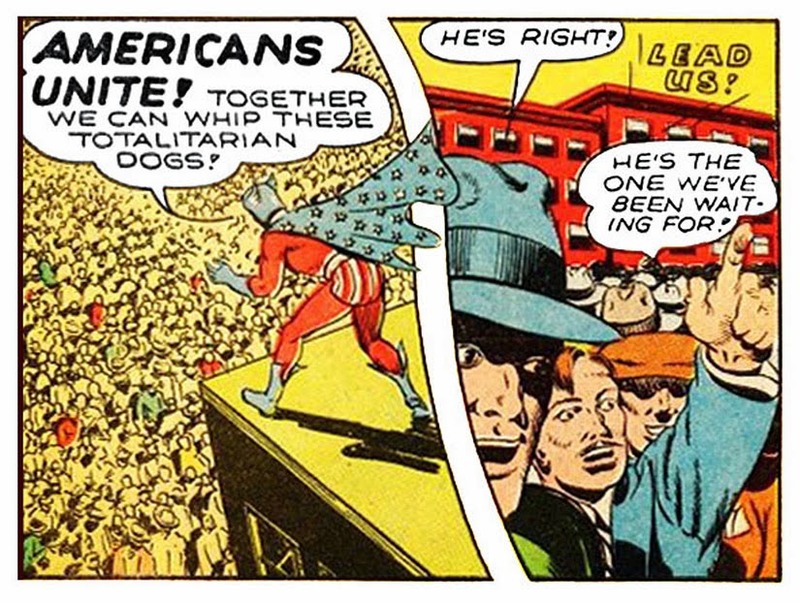 SUPER-AMERICAN And KINKS MASON - Fighting For America's Honor! answers his nation's zero-hour S.O.S.! 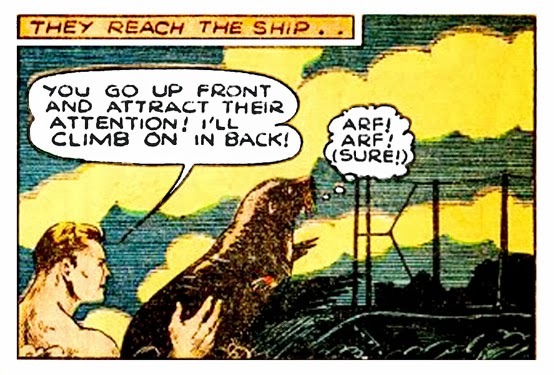 summoned by a despairing scientist from the advanced year 2350. 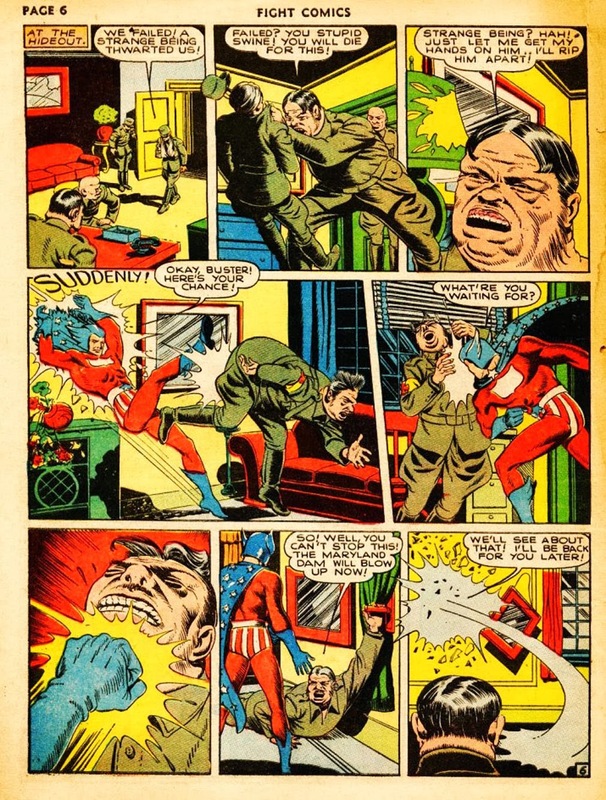 "Hordes Of The Secret Dictator!" 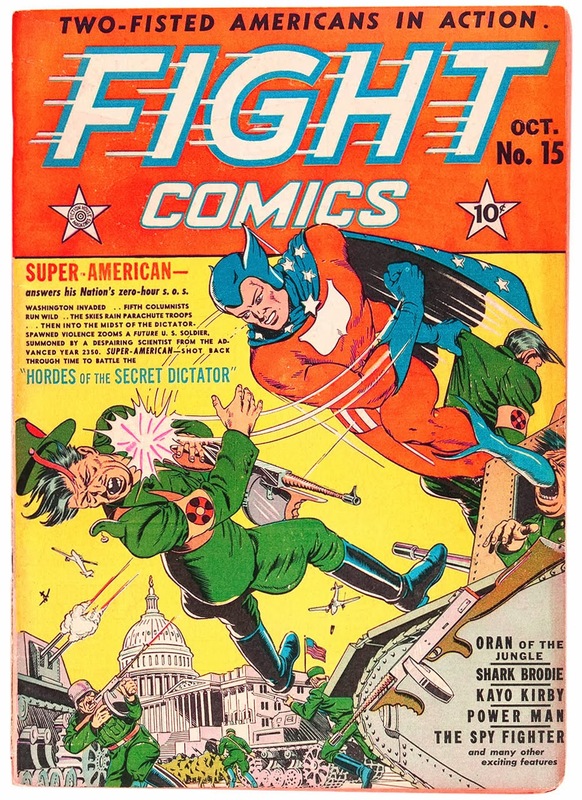 So reads the cover of FIGHT COMICS #15, published by Fiction House in October, 1941. 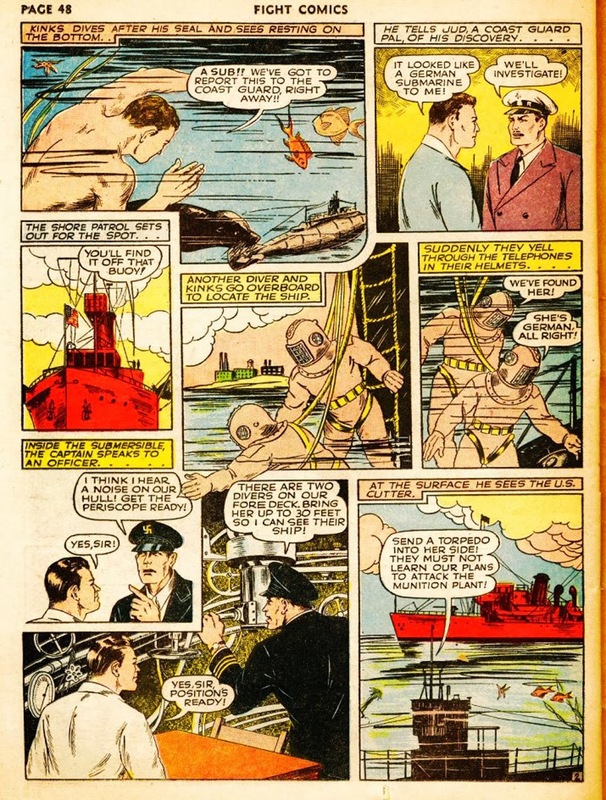 The attack upon Pearl Harbor was still a few months away, and the United States of America had not yet become involved in the World War that was then ravaging Europe. 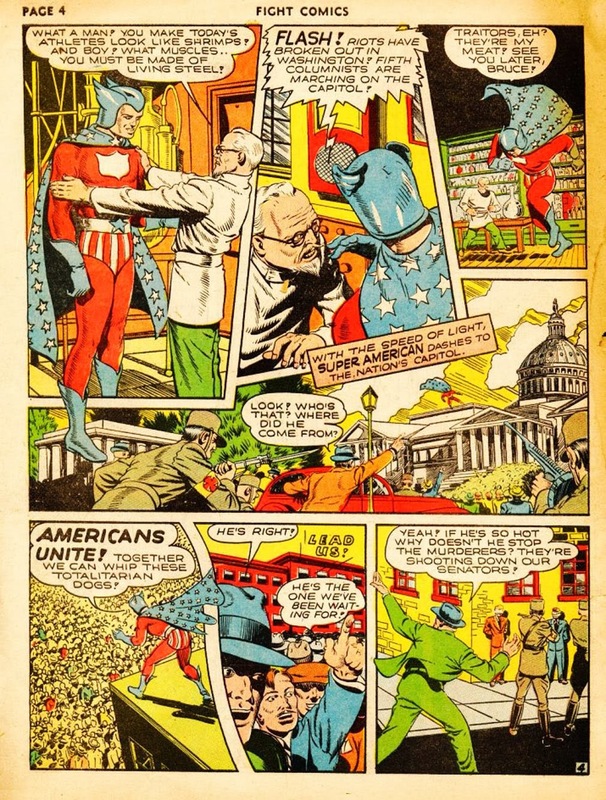 That would soon change, but even when this comic was published there were waves of patriotism washing over the country in North America. 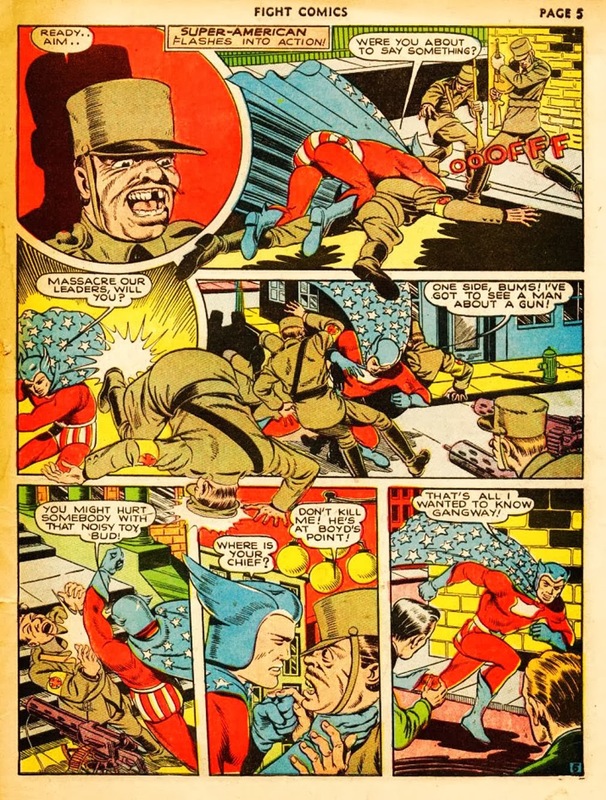 Marvel Comics predecessor Timely Comics had debuted it's own patriotic champion Captain America earlier that year, and other publishers were quick to follow suit. 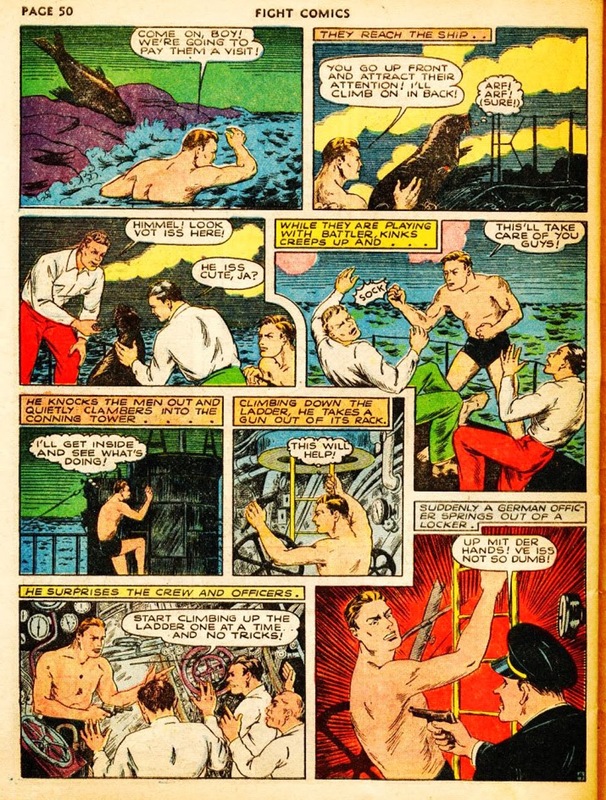 As the title suggests, the pages of FIGHT COMICS were filled with lots of action, featuring stories of boxers, brawlers, battlers, and bashers smacking each other across the face and gut with bare knuckles, gloved fists, and gauntlets. 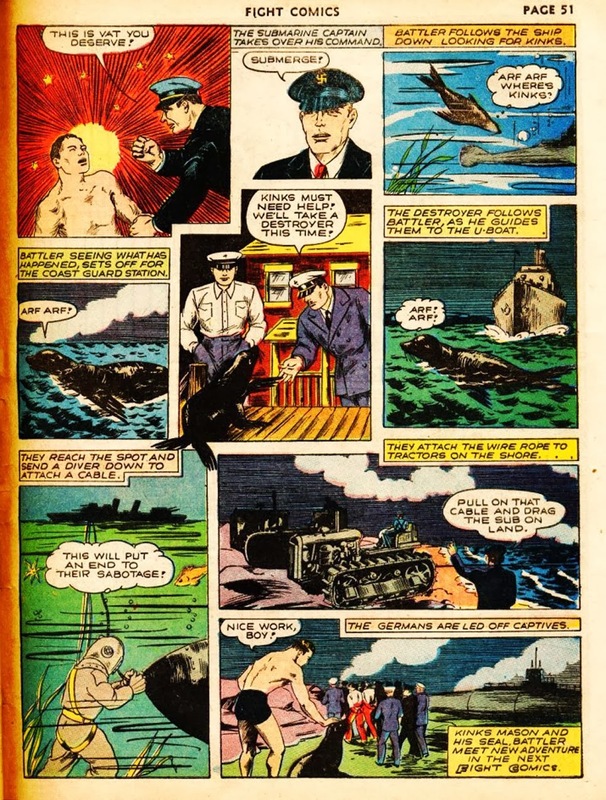 The artist here was Dan Zolnerowich (later Zolne), who did a great job on several covers and stories for Fiction House productions like FIGHT and PLANET COMICS throughout the Golden Age. 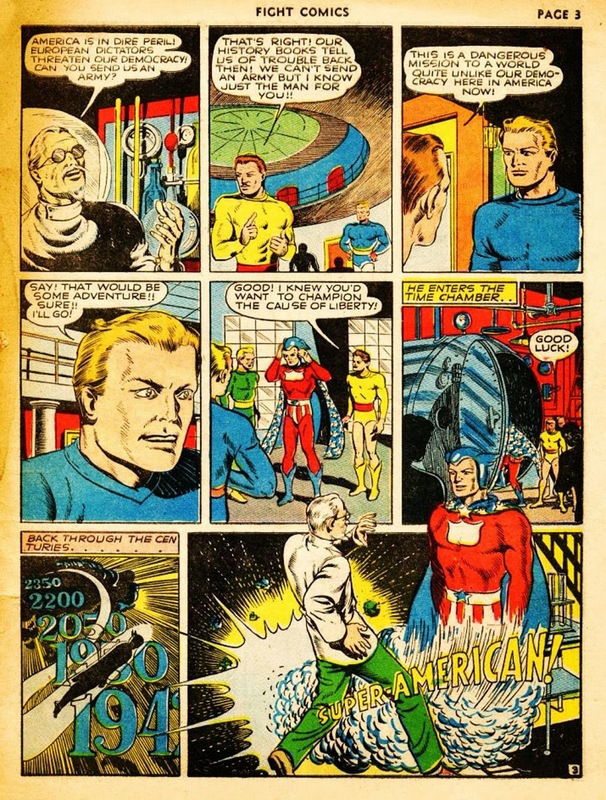 The writer credited as Jefferson Starr (without ship) was no doubt a nom-de-plume for someone whose true identity seems lost through the decades. 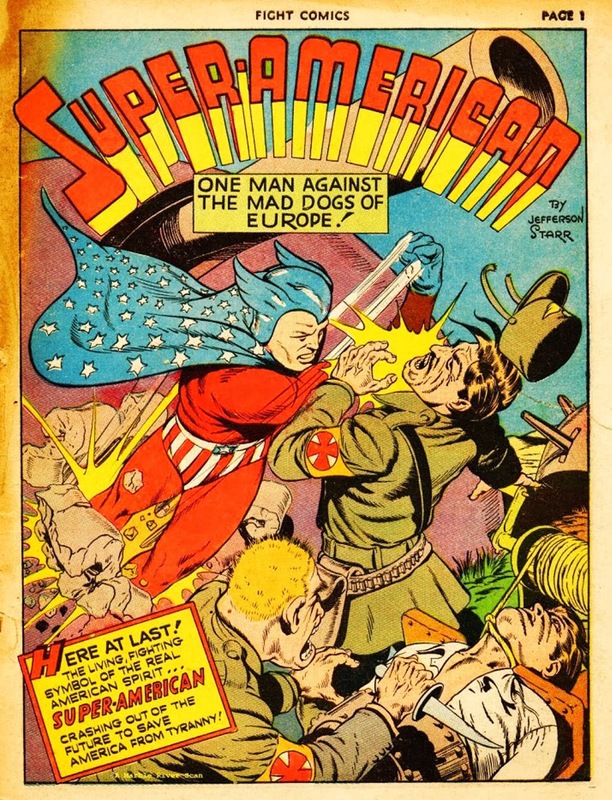 Notwithstanding, the appearance of the character of SUPER-AMERICAN remains a fascinating and ludicrous example of the eras hyper-nationalism. 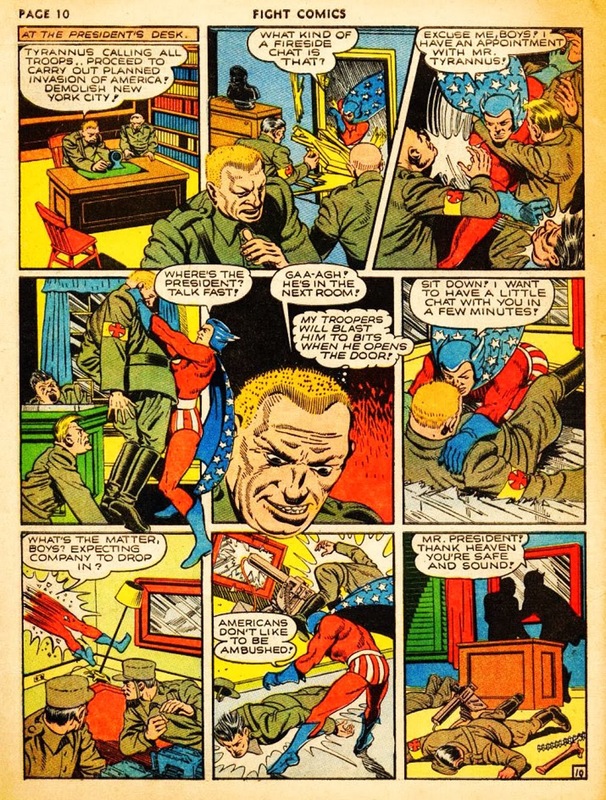 In his debut and origin story, SUPER-AMERICAN emerges as the symbol of constitutional liberty become flesh, and in his zeal for justice and the protection of American freedoms he proves he is capable of standing toe-to-toe with tyranny, looking evil in the eye, and giving any and all non-Americans such a smacking that they will certainly think twice. Like a bull in a china shop, he smashes and crashes through several walls and doors in his haste to give evil a spanking, even descending upon Washington and tearing up Congress. 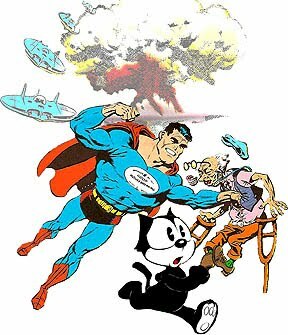 SUPER-AMERICAN needs to smash through the Oval Office wall, and smack that ol' pen and phone right out of Obama's executive ordering hands! 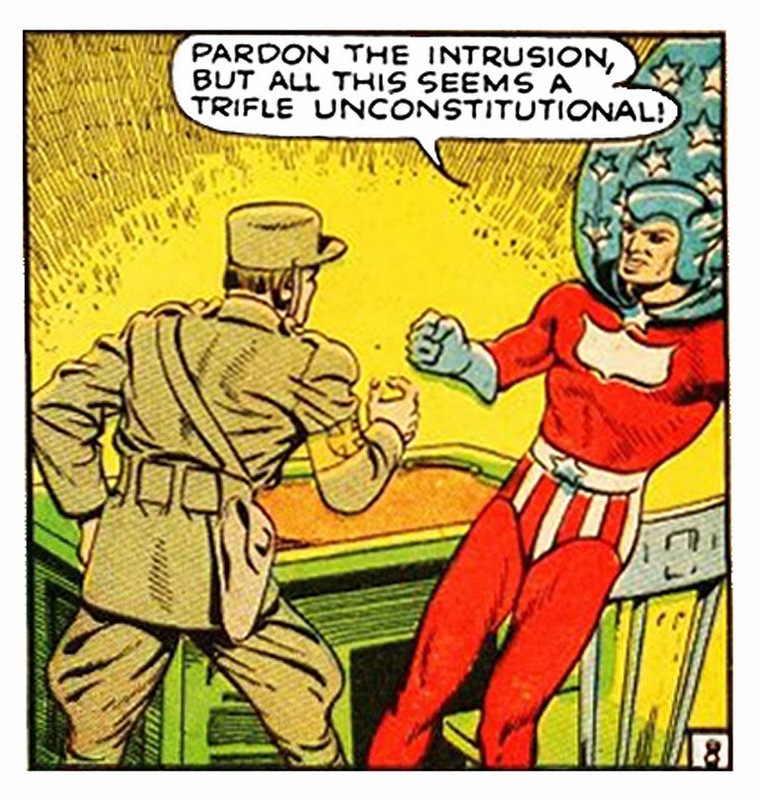 A trifle unconstitutional, indeed! 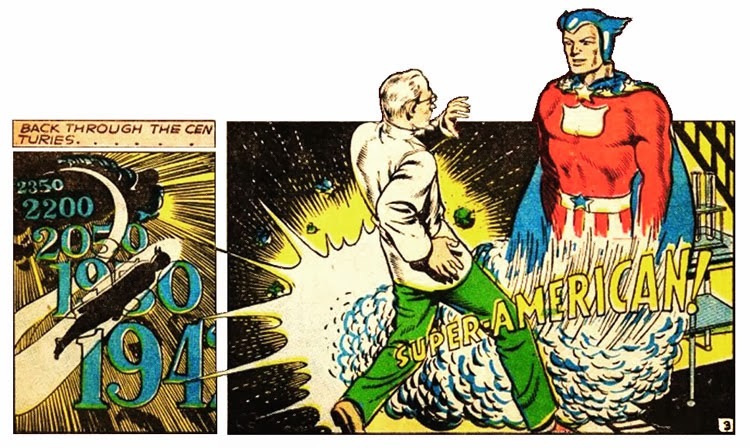 The nut in the star-spangled long underwear might just have something there! 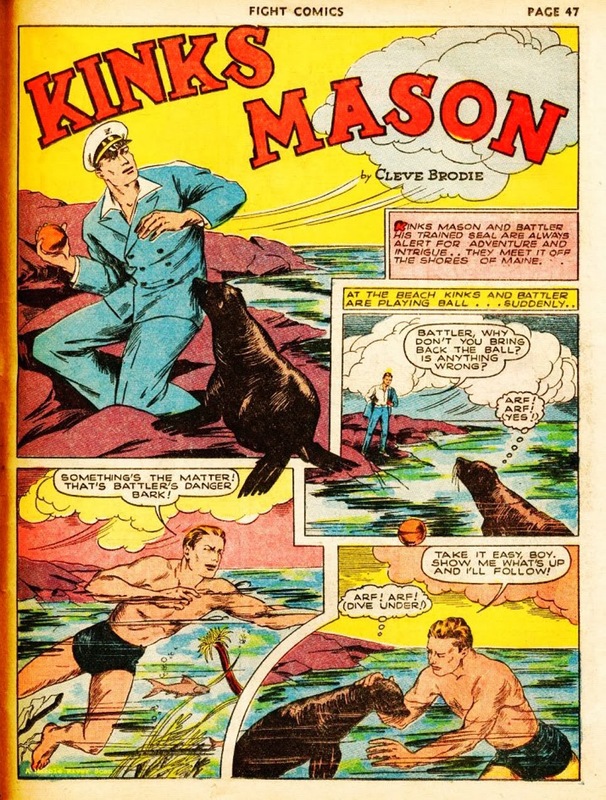 we have the astonishing feature of KINKS MASON and His Trained Seal, BATTLER! 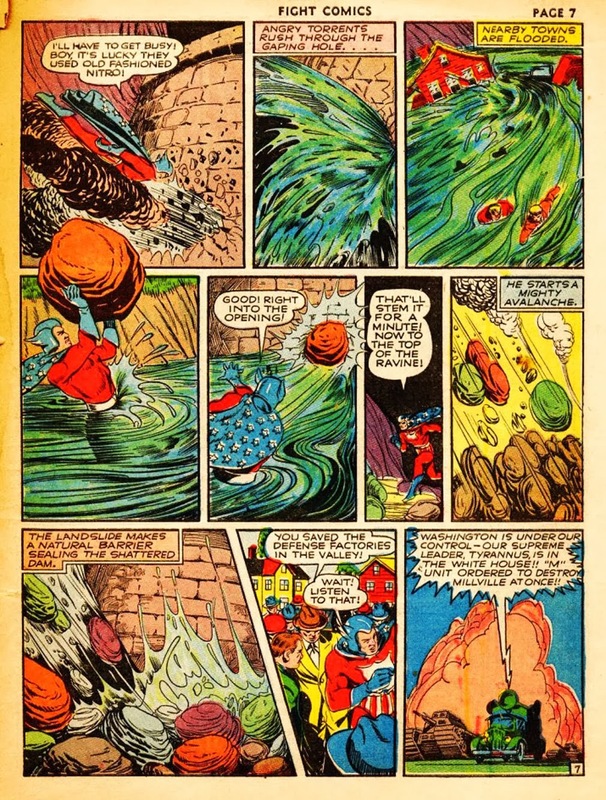 KINKS MASON made his debut in FIGHT COMICS #1, and his adventures always involved lots of underwater action. 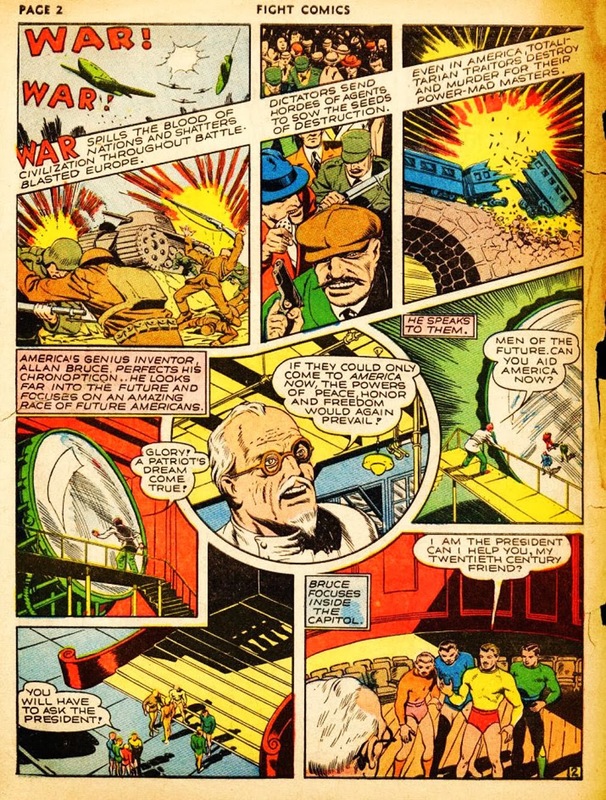 KINKS didn't join up with BATTLER until issue number 7, which is amazing in itself, since it seems like BATTLER was usually doing most of the work and more often than not, saving KINKS fat from the frying pan. 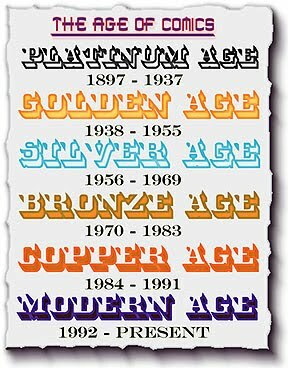 How did Kinks get his name, you ask? Kinks gets himself in a jam, and good ol' Battler has to do all the heavy lifting, as usual! 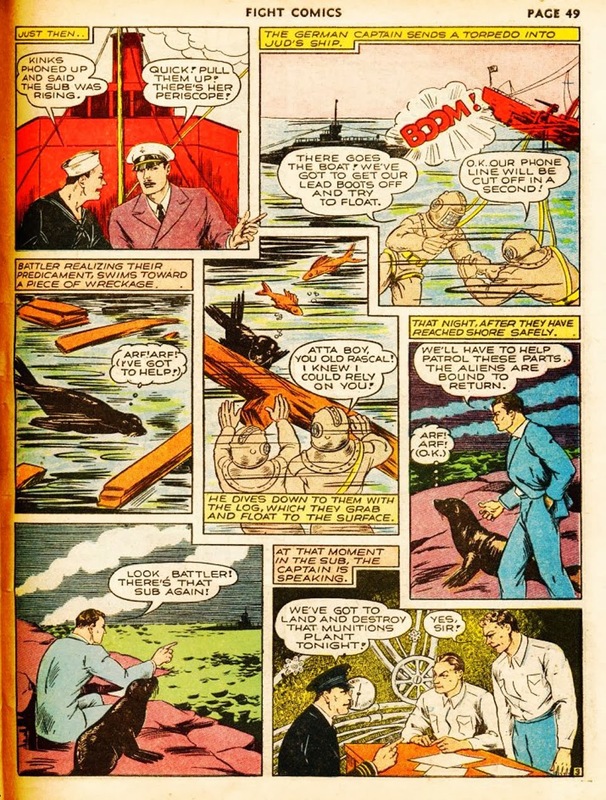 Like a precursor to Lassie or Rex the wonder dog, Battler the trained seal has to search for Kinks, assess the situation, find the coast guard, communicate what kind of messed up snafu Kinks got himself into this time, lead a destroyer to the precise area, and save the day...again! Your welcome, Kinks! What does Battler get for his hard work? Why, a pat on the head! "Good job!" 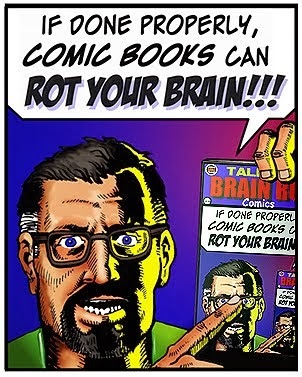 Sadly, this was the last ever appearance of Kinks Mason and Battler in the comics. The tragic tale of what happened to them was never published, but can now be told. 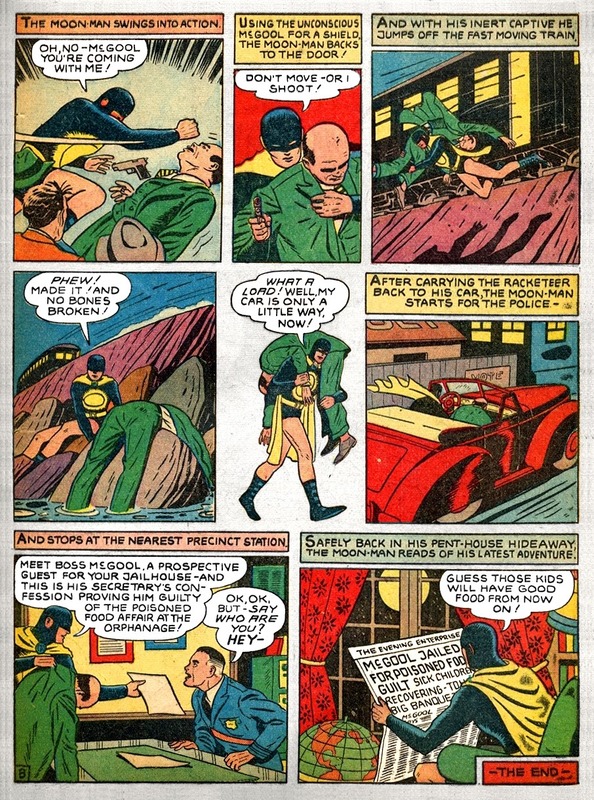 While attempting to diffuse a Nazi bomb, Kinks told Battler to go to the nearest payphone and call the President, but unfortunately, forgot to give him a dime. Battler, replied to the orders with an, "Arf Arf!" 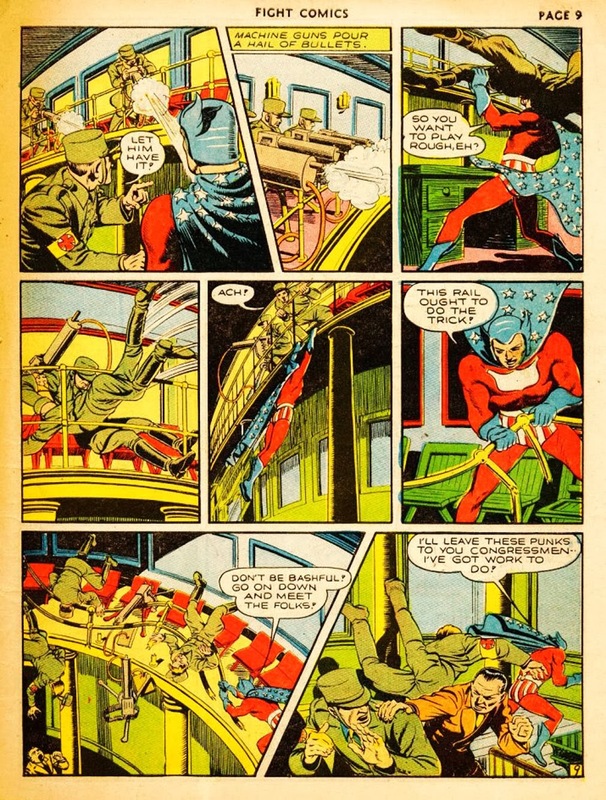 Kinks mistakenly thought he was saying "I'll be back in five minutes! ", when in reality Battler said, "Arf Arf! ", which actually meant, "I'm hungry...I think I saw some fish down there by the rocks...I'm going to lunch now!"